Social enterprise has boomed in Ontario over the last few years - but has it achieved its potential? We know that systemic change is a long and slow process, and that instituting social procurement and matching social finance supply with social enterprise demand are challenging tasks. Much of social enterprise has been driven through the lens of entrepreneurship, with social goals and community needs shunted to the periphery. Too often, social enterprise is divorced from issues like precarious work, homelessness, marginalization and food insecurity. 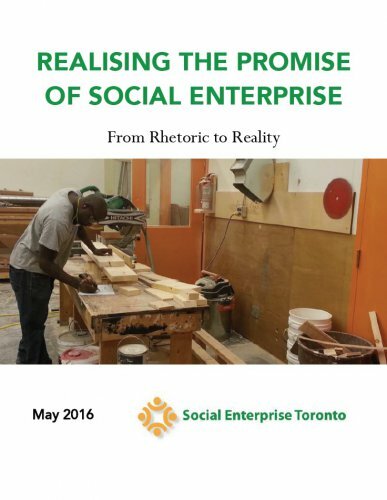 This report brings together half a year of conversations with SE managers and other stakeholders to review the state of the sector and examine Social Enterprise Toronto's (SET) role. Much of this report was published in the form of blog posts over this period. SET hopes that this report will encourage social enterprises and stakeholders to reconsider not just how, but also why, we are engaged in social enterprise – and what we hope to achieve. SET is a network of non-profit social enterprises that share the common goal of supporting and growing social enterprises. These enterprises all provide employment or training opportunities for low income or marginalized individuals in the Greater Toronto & Hamilton Area. They operate in a range of industries, including food, courier delivery, construction, printing, crafts and interpretation. Founded in 2006 as the Social Purpose Enterprise Network of Toronto, SET is a self-managed network funded through annual dues and the support of Toronto Enterprise Fund/United Way.